Mina is a 27-yr-old single mom caring for her 10-yr-old bookworm daughter and her (Mina’s) 17-yr-old juvenile delinquent sister. She works at an auto insurance call center, and hasn’t thought about romance in a long time. Peter is also a single parent, taking care of 9-yr-old twins with the on-and-off help of some neighbors and his broke research student. When Peter gets into a couple car accidents late in the summer, he calls up Mina’s insurance agency for help. Neither of them expect that in the next year, their conversations will blossom into a long distance, over-the-phone friendship that slowly moves towards love. I first saw this book on The Book Bundle, where my friend Emily was offering a copy in a giveaway. I didn’t win the giveaway, but not long after, Ms. Thornton contacted me and asked if she could send me a copy to read and review, and I accepted. I’m so glad she contacted me, because I ended up enjoying this far more than I expected. In general, I’m a bit leery of romance, because it has a tendency to end up unbelievable and/or trashy. 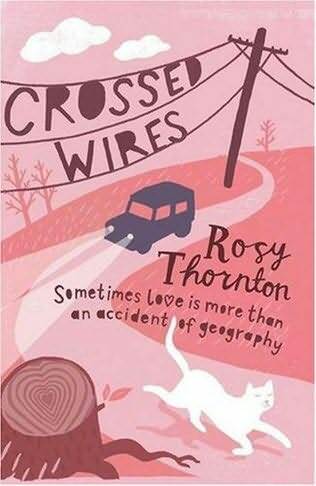 Thankfully, Crossed Wires was neither of those things. Its characters were so real and so easy to relate to. The romance was very Austenesque – not in writing style, but in the timing. It was slow, careful, and deliberate. No trashiness at all. I loved that. Perhaps I’m a bit biased. I just love the idea of two people falling in love through a series of phone calls without ever having met. My husband and I met through phone calls and email and didn’t meet in person for two months. Neither of us knew what the other looked like: he pictured me as a redheaded Molly Ringwald type, and I thought he was blond. It didn’t matter what we looked like, though; we fell in love through words, and it’s really special to me that we did. That’s why I wanted to read the book in the first place, and Thornton didn’t disappoint me at all. Her characters went through the same sort of thing, imagining each other wrongly, trying to figure out the other’s circumstances through offhand comments and such. It was wonderful. I want to tell you the book is not as frilly as the cover might indicate. I think the cover is a little frivolous for the story, actually, but maybe marketing-wise that’ll help it sell better. I don’t know. It’s certainly not something I would have picked up on the cover alone, and the story was not at all what I expected from it. It wasn’t dark and depressing, but it wasn’t a bubbling happy either. It had its slow romance, and it had real world issues, too: the trials of being a single parent, death and grieving, dysfunctional families, prejudice against Irish travelers, poverty, social customs, and mundane every-day life. It was realism in the best way, not gritty, not boring, but not shying away from the world either. So don’t judge on the cover, because the cover’s not really representative of how deep this is. My only quibble with the book itself is that some of the transitions seemed really abrupt to me. A couple of times I was jarred because it felt like a paragraph or two were missing. Part of that, I admit, may just be my ignorance of British writing/speaking style. There were a lot of British stylistic things I had to get used to. I’ve read a lot of British literature, but 95% of it is old classics, and the other 5% probably mainly consists of Harry Potter, which has been Americanized on the way over. Brand names, phrasing, vocabulary, etc – much of it was new. Despite the transition issues, I loved most of the British-isms. It really transported me to a different world. I know the UK is not extremely different from the US but it was different enough for me to feel like I was vacationing a bit. Originally, I was going to give this book away after I read it. I felt like I needed to help it get out into the world and get more face- and blog-time. It deserves to be read. However, I loved it too much. I can’t give it away. I’m sorry. I want to keep it. Note: This book was reread and re-reviewed in 2010. This entry was posted in 2009, Adult, Prose and tagged comfort, favorite, memorable. Bookmark the permalink.